Some people live to work; others work to live. I’ve never believed that cliché line. While it may apply to a relatively small number of folks at either end of the spectrum, I think most of us fall somewhere in between when it comes to our attitudes towards work. True, we head to the office or job site every day to support ourselves financially. But our jobs ideally give us much more than a paycheck. The work we do gives us a sense of satisfaction and happiness, and, in some ways, defines us. Good to meet you, Karen. What do you do? So, what happens when your job stops offering those important non-monetary benefits? What if going to work has become a slog punctuated by longing glances at the clock and calendar? The obvious answer for someone who is mid-career is to find a new job or career. 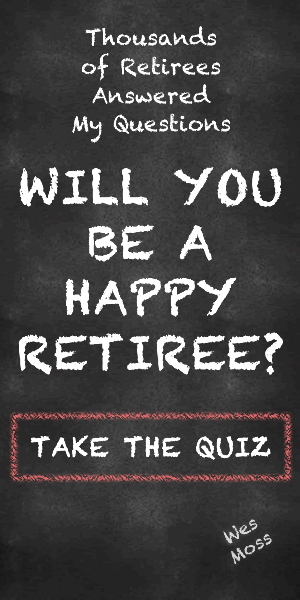 But if retirement is an option, maybe it’s time to find your bliss in post-career pursuits, even if that means retiring a few years earlier than planned. If work is feeling like a grind, ask yourself the following questions. The answers might help you decide whether it’s time to seriously consider turning in your key and pass card. 1. Is your commute longer than 45 minutes? A lengthy commute takes its toll in several ways. You know the stress of a long drive isn’t healthy for your body. But did you know a long commute can harm your relationship, too? If one spouse commutes longer than 45 minutes, the couple is 40 percent more likely to get divorced, according to a recent study. That finding makes sense. Time spent in the car is time you aren’t engaging with your spouse and family. What’s more, the stress of the drive can make the commuting spouse less-than-delightful when they arrive home. 2. Is your work schedule unhealthy? Shift work, on-call requirements and other scheduling uncertainties are rough on your mental state, health, and happiness. A recent study of 28,000 food and retail workers found that employees who work full or partially on-call schedules were significantly less likely to report feeling happy and were more likely to sleep poorly. Some businesses and organizations absolutely require shift work and on-call duty to meet their customers’ needs. If you work in such an industry and can’t escape that sort of schedule, make an honest evaluation of how the uncertainty is impacting your health and happiness. 3. Do you love your job – really love it? Every job has some unattractive aspects; that’s why they call it work. But any job worth having is studded with enough fun, excitement, and challenges to make you look forward to going to work. You should still be learning, growing, teaching and sharing with some degree of passion. We all like to feel that our work somehow matters; that we are putting our own little positive mark on the world. If your job is no longer providing that sense of purpose, it’s time to look for fulfillment elsewhere. If you’re making that 45-minute-plus commute every day just for the money, here’s a pro tip: No paycheck is big enough to justify keeping an empty or soul-crushing job when retirement is a real option. We all want to be appreciated and recognized for our contributions. Yes, paychecks serve that purpose, but true fulfillment requires a more direct personal touch. If you aren’t being thanked and acknowledged, maybe it’s time to retire and apply your amazing abilities elsewhere, perhaps by volunteering with a non-profit or consulting in your field. 5. Have you topped out financially? Most jobs come with built-in salary caps that are largely set in stone. If you are a corporate employee nearing retirement age, there’s a good chance you are maxed-out on compensation. Barring the occasional bonus or cost-of-living-allowance, you are unlikely to see a raise. Worse, that maximum salary might become a target on your back if the company decides to “surplus” (a.k.a. lay-off) employees to cut costs. So, if the job has lost much of its appeal; if you’re just collecting a paycheck to add bonus weight to your nest egg, you might consider calling it a career. You can generate income from other sources, such as rental properties or a part-time job in a field you enjoy. A rewarding job is a blessing, and we should all be free (and feel free) to keep such a position as long as we please. I’m not a fan of mandatory retirement ages. But, if the rewards of work no longer outweigh the demands, you should feel equally free to move to your next career, as a full-time retiree.